DAPPBOI – The human backed Ethereum token. BOI is a token, where each token is backed by 1.0 hour of my time as a freelancer. It allows people to speculate, trade and invest in a tokenized form of my freelance hours. 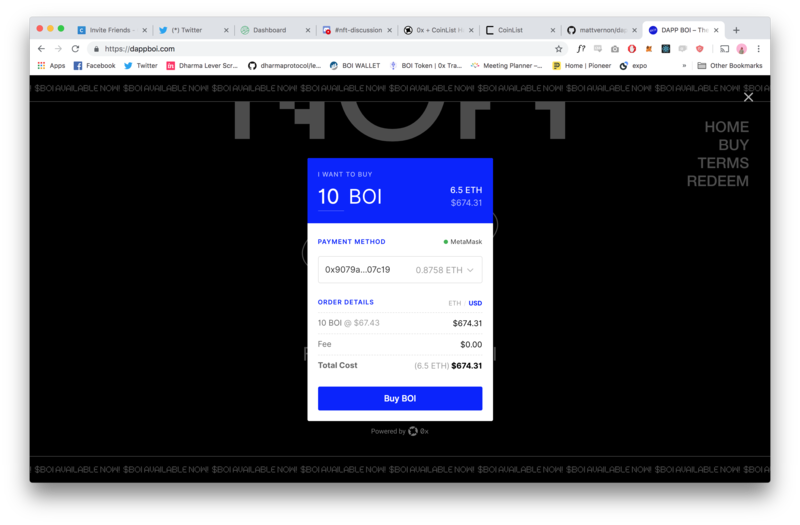 I've launched BOI – an Ethereum token, where each token is backed by 1.0 of my time as a designer. This is an exploration into the idea of personal tokens, which are tokens that derive their value by the backing or performance of a sole individual human being. I am a freelance designer, which means a lot of my time is spent dividing up my days and selling my hours to clients at a specified hourly rate – I thought this would be an interesting application for tokenization, and could have some weird effects when secondary markets for the token come into play. So I've tokenized 100 future hours of life on this earth into 100 BOI which are now live on the Ethereum Mainnet, and purchasable through the website with 0xInstant. By purchasing BOI tokens, people gain the ability to pre-purchase availability from me, and lock in an hourly rate. They're free to hold on to these for as long as they like, which essentially allows them to speculate on my performance as an individual. This essentially turns me into a ~ publicly traded human being ~ with a stock price that can swing up or down. If a holder wants to redeem their token, they send it back to me – and we organise the work manually – so there is an necessary element of trust in the system, however – by holding a percentage of the tokens I am financially incentivised to honour the system in place. The idea of personal tokens could definitely open up some dystopian/Black Mirror-esque applications, but I also believe it could be an amazing way of funding freelancers, and creatives.